Office flooring is an essential to the office design making the first impression on clients and staff. Flooring in an office must be easy to maintain and fit the aesthetic. Often treated as an afterthought, office flooring is one of the designs carried throughout the entire space and most visible. In addition to design, flooring is a primary element in providing comfort and consistency in a space. Carpet is flooring where in a layer of pile is added to a backing. Commercial carpets are a great option for an office setting. They are constructed to hold up against heavy foot traffic, reduce noise level, and minimizing falls. The reduction of noise level can improve office productivity. Along with improving productivity, carpets provide safety by minimizing injuries and occurrences of trips and falls. Carpets contribute to the overall comfort and warmth in the office. Carpeting options gives companies the ability to add a creative element to the aesthetic of the office. To enhance the value and design in any office, carpets are available in a wide variety of patterns, colors, and styles. 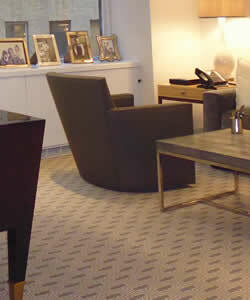 Carpets are a fun way to maintain a professional look while blending a homelike feel. There are several carpet types available to offices such as, commercial grade, broadloom carpet, and modular carpet tiles. Carpets offer other advantages to your office space including relatively easy maintenance due to the new manufacturing with stain guards for easy clean-up. Regular cleaning and vacuuming ensures your carpet’s longest life. Over time when properly maintained, a carpet can save your company money in both installation and cleaning. Carpets also save money by giving insulation during the winter and summer months. There are several drawbacks to carpeting that should be considered for offices. Due to the material, carpets have problems with moisture, mildew, and damage to the pattern. When deciding the flooring for your office, many components should be taken into consideration. The multiple areas within the office have differing needs and requirements from the flooring. When choosing flooring for large corporate space or smaller office, we have the information to choose between the different types of floors. The different types of commercial flooring offer different materials and price points. Carpets, tile, vinyl, hardwood, and laminate flooring are available for commercial spaces. Pros: Hardwood floors are visually appealing in any space. Aesthetically, hardwood floors add character and can be refinished if any damage occurs. Maintenance for hardwood floors is easy with regular cleaning. When maintained properly, hardwood floor have the potential to last for a very long time. Cons: Hardwood floors tend to be on the higher end of the budget. Unlike carpeting, hardwood floors are not noise reducers. Hardwood floors can be noisy in spaces with high foot traffic. Rolling office chairs can cause damage in any office flooring; chair mats are one option to help protect the floor. Along with scratches and scuffs, hardwood floors are prone to splinter or buckle if exposed to high humidity and moisture. Pros: Vinyl flooring is a great cost effective option for commercial flooring. Available in a variety of designs, patterns, & colors even some resembling wood, stone, or concrete, to suit any design. Vinyl tiles are durable and water resistant perfect for high traffic areas. Maintenance for vinyl is very low and minimal. Cons: Vinyl floors are manufactured using PVC. The tiles have self-adhesive glue which can weaken over time causing the edges to rise and tear. The tiles are prone to denting, grouting, and damage due to moisture. The surface due to cleaning over time can become dull or discolored. Pros: Concrete is a low cost flooring able to hold heavy equipment. Concrete is completely customizable with addition of glass, seashells or metal parts to add unique interest. Epoxy coating types can be applied creating the decorative surface. The maintenance for concrete floor is low-cost and simple. Cons: Concrete floors are porous and absorb moisture. This makes the concrete more susceptible to mold and mildew. Concrete is hard and uncomfortable to stand up on over long periods of time. Unlike the natural insulator, carpet, concrete does not have insulation and is cold during the winter months. Concrete has a very modern and industrial aesthetic and may not suit all décor styles. Whether you decide on carpeting for your office or not, we have the insight and knowledge to find the perfect office space. While searching the market, allow us to ease the process at no fee. 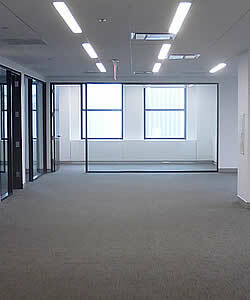 With access to every commercial space in Manhattan, we can make this process as seamless and efficient as possible. Call or email us your specific office requirements.